The Port of Mostyn has been selected as a potential site for a Spanish train manufacturer’s UK base in a move which could create 1,000 jobs. 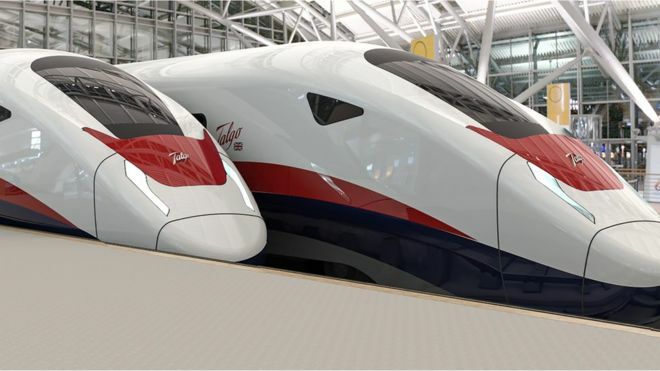 Talgo says it aims to enter the UK train market, through ‘true manufacturing’ – instead of assembling kits of parts from overseas, the company wants to source components from within the United Kingdom. There are five other shortlisted locations; three are in England and two are in Scotland. “North East Wales with its long history of manufacturing expertise and its wide skills base has a huge amount to offer Talgo as the location for its UK train manufacturing facility, and we would be delighted to welcome this prestigious company to the region. Over the last 18 months both I and Welsh Government officials have worked extremely closely with Talgo and the Port of Mostyn to help make this unique opportunity a reality. All our collective hard work has only served to confirm my belief that together we can deliver a world class and long term manufacturing home for Talgo. “The Port of Mostyn greatly welcomes being considered by Talgo as a site for their proposed U.K locomotive and rolling stock manufacturing facility. For the past eighteen months we have been working closely with Welsh Government to identify and satisfy Talgo’s requirements and believe we can now offer them an ideal manufacturing site. This site has a direct connection to the main railway network for new trains to be delivered directly to Talgo’s U.K. customers together with adjacent port facilities for their future export programmes.